We’re jumping for joy at Cyber-Dating Expert Headquarters as October is our Anniversary month. of the launch of CyberDatingExpert.com. It’s been 7 amazing years of providing online dating advice for singles looking for love online and on their mobile on phones on our site. 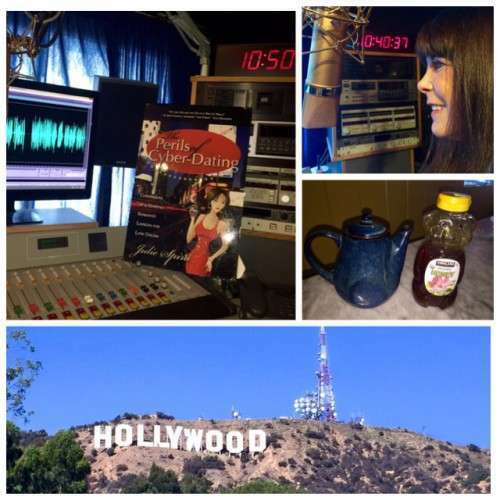 As a special surprise, I’ve been in Hollywood in the studio for weeks recording the audio book version of my bestseller, The Perils of Cyber-Dating. The exciting part is we’ve added a surprise Epilogue to the book that will warm your heart. Beware, some who have seen and heard a sneak preview have gotten teary-eyed with this new ending. Take a look at the behind the scenes photos below. Plus! We’ve added some fun and new BONUS audio dating tips on how to date on Tinder and other mobile apps, as well as other flirty dating tips to help speed up your search. These are not included in the print edition, so keep an eye our for our release date! I’m grateful for my amazing producer Jeff Davis who is still in post-production on the project and all I can say is WOW! Thank you from the bottom of my digital heart. Turning lemons into digital lemonade has been an amazing journey and touching the lives of singles worldwide has been a complete joy. Reading the book again was a very emotional experience. I had to stop a few times and reflect on my romantic journey, while sipping tea and honey to keep my voice going for 15 hours! Many thanks to my friends on Facebook, who after crowdsourcing a handful of book covers designed by the lovely Megan Johnson, it was almost a unanimous vote for the book cover in this post with the gold seal. While some authors don’t like to read their own books, I felt strongly about having my voice heard in this memoir, plus I spent years in radio on-the-air and as a voice-over announcer, so I’ve been trained in radio. I hope you’ll like the final audio book as much as I do and that it will help you on your journey to finding your true love. Wishing you much love and joy in cyberspace, or wherever you may roam. xo.